Alibaba, the internet-based e-commerce giant whose record-breaking U.S. IPO raised $21.8 billion earlier this month, recently established an exclusive headquarters for its new international corporate affairs team, at 140 New Montgomery Street in San Francisco. Alibaba’s mission, to make it easy to do business anywhere, resonated deeply with Principal Builders whose allegiance is to turning challenges into solutions. PBI, working in collaboration with Studio O+A, delivered the build out of the space, a 8,600SF jewel box on the top floor of the iconic Art Deco building in just 10 weeks. Our design-build project team focused on striking the right balance between design aesthetic, availability and integration of materials, and cost to execute the signature space. The exacting restoration of the space’s historic plaster ceilings, damaged by seismic renovations, back to their original condition was of paramount importance. 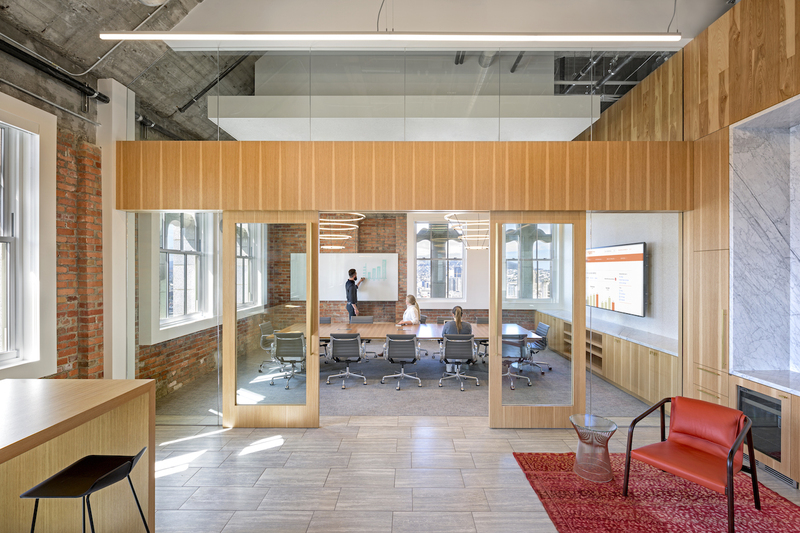 Another signature element of the space is the warm and spacious reception area highlighted with 15′ foot tall wood paneling and an executive briefing/hoteling center featuring specialized acoustic fabric panels that seamlessly integrate with the restored ceilings. One of the most valuable tech companies in the world, Alibaba has since been profiled on 60 Minutes.